It's happening. No joke. Right on time. Just as dream-Laura said to Dale Cooper. 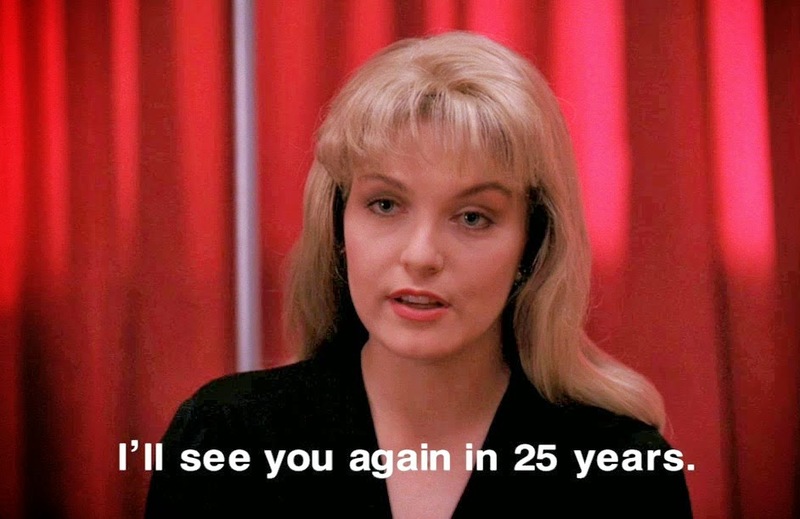 Twin Peaks, arguably the most influential television show of all time, is coming back. We will see it again 25 years after that final episode of its second season in 1991. Not a remake. Not a relaunch. It's going to be an honest to goodness continuation of the ground-shattering series. With creators David Lynch and Mark Frost writing the episodes and Lynch himself directing every one. The nine episodes of Season 3 (jeez did I really just write that?) will run on premium cable channel Showtime in 2016. Earlier today Kyle MacLachlan tweeted that he would be returning as FBI Special Agent Dale Cooper. The last time we saw him in 1991, "Coop" had been taken over by the ultra-malevolent spirit Killer BOB, smashing his own head into the bathroom mirror and screaming in mock rage about Dale's girlfriend. Except it was strongly implied that the real Cooper was still trapped in the Black Lodge (sort-of a Hell dressed up to look like a French bordello, and everyone in it talks backwards). Deadline Hollywood has tons more about Twin Peaks' return as does The Telegraph. Look! Official announcement video from Showtime! This is a big, big deal. That cannot be stressed nearly enough. I was intending on being in "radio silence" on the Internet for this coming week as I finish up writing the third part of my book. This news totally jerked me out of that. Or maybe there was something more amiss. During the weekend I came across my CD of the Twin Peaks soundtrack, composed by Angelo Badalementi. It was released in September of 1990 and I bought it that first week. I was thinking of putting it on my iPad for listening while I work. No question about that now. If Showtime can bring back Twin Peaks, HBO can bring back Carnivale. Michael J. Anderson can be back as the dancing dwarf and Samson both. Oh HECK yes!! That is all that's needed now to make everything right in the world. We're at last going to get closure with Twin Peaks, thanks to Showtime. Maybe that will kick HBO into bringing back Carnivale. Season 3 and 4 were going to be about ten years after the end of the second season so it would be a perfect fit. Season 3 was going to start off years later, Ben would have taken over Management's role in the carnival. Funny how the two most surreal TV shows ever were also consequently two of the very best of all time and they both feature Michael J. Anderson. Here's hoping we see him in the new Peaks episodes and that we WILL see him again as Samson. "LET'S SHAKE SOME DUST, CHILDREN!" Dale Cooper has been locked away in an insane asylum near Seattle for a quarter century. The doctors have for all intents and purposes given up on understanding his psychosis, much less treating it. Cooper is chronically violent and continues to insist that his name is "Bob". Harry Truman retired years ago from being sheriff. He and Annie comforted each other after the events of that terrible night and fell in love with each other. They married and have two children. Hawk is the sheriff of Twin Peaks and has been for many years. Andy and Lucy are married. Their child is now in grad school. James and Donna married. They have a daughter: they named her Laura. James is now the leader of the Bookhouse Boys. Dr. Jacobi moved to Hawaii some time ago. Bobby fulfilled his father's vision and is now a loving husband and father in his own right. Shelley took back her life, went to school and is now an attorney in Portland. Norma sold the Double R Diner ten years ago but insisted that there be no changes made to the recipes for cherry pie and coffee. The Double R attracts customers from across America and Canada. It even has its own website. Nadine made another suicide attempt. This time she succeeded. Leo Johnson is a drooling mess at the local nursing home. Every so often he begins screaming about spiders. Audrey Horne is now a senior Special Agent with the Federal Bureau of Investigation. She never married, finding fulfillment instead with her life in the FBI. Catherine has mellowed somewhat, but there is still a fire in her eyes. The mill was rebuilt, but nothing was ever quite the same again. Twin Peaks itself has weathered the tides of time. Some are still here, some have passed on, and still some new came to town. This is the way it is. This is the way that it seems it will always be. Nobody talks about what happened all those years ago. And then, late one night at the Roadhouse, the doors swing violently wide open. Just down the road, the traffic light turns red. Behind the locked door of his room, for the first time in twenty-five years, Dale Cooper's eyes have within them a glint of sanity. Somewhere else, owls are gathering. At Glastonbury Grove, something is stirring. Jupiter and Saturn are about to meet. For a quarter century, the darkness in the woods has laid silent. And then, a body is found on the shore of the lake, and it reminds the long-time residents only too well of another body that was found there many years ago. The darkness has come. And if it is not stopped it will envelop all of mankind. Only one man stood in its way before. The last time. Only one man has the key to standing against the Black Lodge and bringing an end to its evil forever. Dale Cooper is returning to Twin Peaks. I don't know. Those two are hard to figure out. Somehow I think Jerry would wind up as a storefront lawyer a'la Saul on Breaking Bad. But Ben? Maybe he ran for United States Senate, lost and then retired to a Zen monastery. Josie is in the bargain bin at Goodwill store still stuck inside the nightstand drawer knob. Sir, that is literally the funniest thing that I've read all week. I can just see that! Maybe we'll finally see her?? I remember during the show's first season when Mark Frost was with the cast on one of the daytime talk shows and he promised that in the second season we would see "parts" of Diane. And that didn't happen. So maybe in Season 3 (still feels so crazy to write that) we'll see Diane at long last. So far as I know there has been one and ONLY one description of Diane. It was in the Agent Cooper: My Life, My Tapes book that came out when the show was in first run. In one of the transcripted entries he records meeting his new secretary Diane and that he thinks she could be a cabaret singer. Later on he makes another entry and asks Diane out to dinner. It's quite a fascinating book. From the time that Dale gets his first tape recorder for Christmas when he's ten, on through his college years and then when he joins the FBI. The final entries are him lamenting that there is no real hurdle anymore, wondering if there is anything left that will challenge him. The very last entry is him telling Diane that he's just gotten a call to investigate a murder in a small town in northeast Washington. Between this, the Secret Diary of Laura Palmer, the audiotape of Cooper's investigation which also had material not heard on the show itself, and the Twin Peaks Access Guide to the Town, this show had a LOT of extra media for such a short-lived series.